Based on a novella by Elizabeth Spencer, the story is set in the 1950s and revolves around Margaret Johnson, a wealthy Southern woman and her daughter, Clara, a beautiful and surprisingly childlike young woman who spend a summer together in Italy. When Clara falls in love with a young Italian man, Margaret is forced to reconsider not only Clara’s future, but her own deep-seated hopes and regrets as well. Nominated for eleven and won six 2005 Tony Awards, including best original score. “The most intensely romantic score of any musical since West Side Story.” -The New York Times. 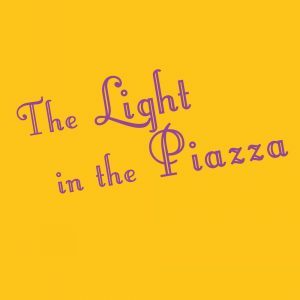 Street Theatre Company will be holding auditions for THE LIGHT IN THE PIAZZA on Monday, February 18th, 7pm-10pm with potential callbacks on Wednesday February 20th at 1120 Elm Hill Pike, Nashville, TN. Please bring your headshot and resume and prepare a 32 bar cut in the appropriate show style. Bring sheet music in the appropriate key (an accompanist will be provided.) No tracks or pre-recorded accompaniment. Please be prepared to provide weekend and evening availability for March 2nd through April 20th. Auditions are by appointment only. Please email auditions@streettheatrecompany.org with any questions and to schedule an appointment. THE LIGHT IN THE PIAZZA is directed by Ernie Nolan and musical directed by Rollie Mains. Margaret Johnson: An elegant, self-possessed, practical American woman. Strong and self-assured. To play mid to late 40?s. Clara Johnson: Margaret’s 26-year-old daughter. Young and naive for her age with a youthful simplicity and exuberance. To play mid to late 20?s. Fabrizio Naccarelli: A 20-year-old, handsome and charming Florentine. Youthful and passionate energy. To play early 20?s. Giuseppe Naccarelli: Fabrizio’s older brother. A lady’s man. Very Italian. To play late 20?s to mid 30?s. Franca Naccarelli: Guiseppe’s wife. Very passionate and strong. Unhappy in her marriage but in love with his husband. To play late 20?s to mid 30?s. Signor Naccarelli: Fabrizio’s father. Very charming, charismatic and insightful. Loves his family. To play 40’s to 50’s. Signora Naccarelli: Fabrizio’s mother. Cunning and intelligent. The foundation of her family. Soprano with strong low range or Mezzo with strong high notes. Roles offered are both stipend and unpaid. Rehearsals will begin on or around March 2nd. The show runs April 5th-20th at 1120 Elm Hill Pike, Nashville, TN.